Et Cetera Papers is all about versatility, inspiration and bringing you unusually good products. 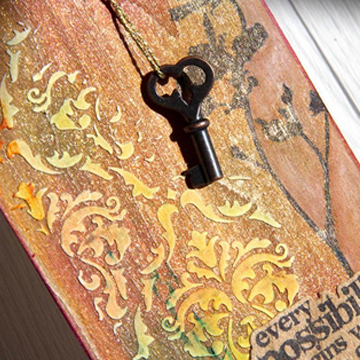 Folks constantly tell us how they’re having a blast creating their own special masterpieces using our real wood paper. It’s our desire and pleasure to bring inspiration and help contribute to the creative process by providing great products to d.i.y.er’s, crafters and artisan’s. 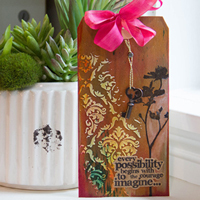 Today, we’re super excited to share a special post combining our woodgrain papers with Ranger Ink and Tim Holtz products. Imagine the possibilities! 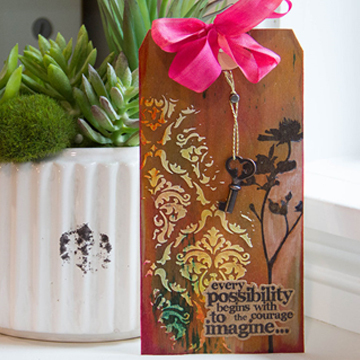 Check out the creation Tim Holtz made on the Ranger ink site. 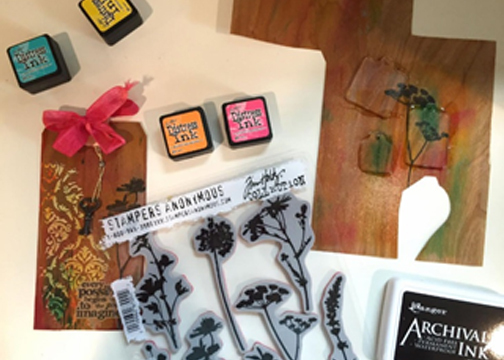 It makes perfectly good sense pairing our wood paper with Ranger Ink and Tim Holtz products. Our wood paper is a wonderful canvas working as a great foundation for just about any project you could possibly think about creating. Our wood grain paper is made using thin slices of real wood, making it a perfect choice when applying layers upon layers of special types of techniques. Our tag is totally inspired by Tim’s style. We’ve had the opportunity to now test and showcase how those various distress inks, sprays and mediums play in tandem with our wood paper. We love the results and can’t wait to create even more! Look at how the Distress Mica Spray reflects the light off of the wood paper. LOVE IT! We’d like to have you join our ever-growing family. Sign-up for our ETC Paper’s blog and receive a weekly dose of inspiration and a coupon sent directly to your in-box. Good towards trying out any of our real woodgrain products. Don’t forget to check out all the various online resources for Ranger Ink! 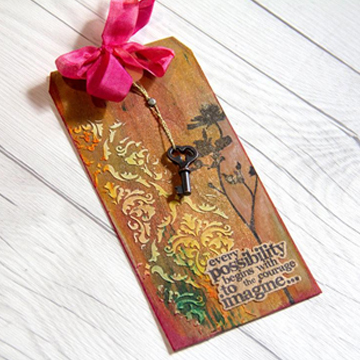 This entry was posted in Crafts & Kits, DIY Projects and tagged possibilities, tag, Tim Holtz.